Over the years many people have asked me about what books to read to a firstborn when a brother or sister is on the way. The books below are ones that I purchased for PudStar when I was pregnant with ChickPea. The poor little mite was flooded with baby books, flooded I tell you. I pretty much replaced all the books in her bedroom with books about babies, sisters and brothers. It’s a wonder she didn’t have nightmares about babies. We read them all to her, and let her explore them as she wanted. We often found in her room looking at all the babies crying, sleeping, feeding, crawling, and her play with her dolls reflected what she knew about babies from the books.I know books are my passion, but one book just didn’t seem enough, because it was the collection of books that gave the full picture of what to expect with a baby. 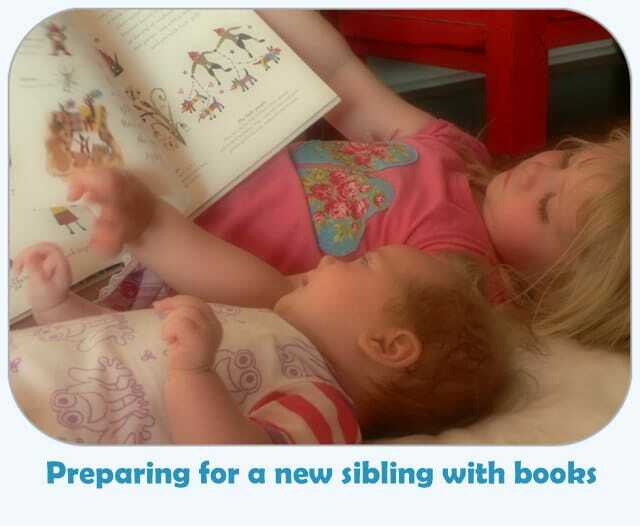 Each book focused on a different aspect, and I would find it particularly hard to single out one book as ‘the best’ for preparing a child for a sibling. My advice would be to buy a few, and source the rest from your local library. Really it was money well spent in my case…PudStar adored ChickPea from the moment she entered the world. She often made comments based on the books; when she first heard her sister cry for the first time she exclaimed how she must be just like the baby in ‘The Perfect Baby’; how she thought ChickPea might be an artist one day like in ‘There’s Going to be a Baby’; and when nappy changing she’d chant “this one has a funny smell!” from ‘Here Come the Babies’. This is our first picture of the girls together. Chickpea is about an hour old. This was my collection of books about babies, which I’ve now given away to friends as there will only be the dog variety of baby for us from here on in! The ‘I Love My…’ books by Anna Walker are just lovely if you know what gender you are having. We purchased the sister one for Pud as soon as ChickPea was born. She carried it in her ‘handbag’ everywhere. in this one we meet Olllie’s new baby sister; together they giggle and play peek-a-boo! Meet Olllie’s new baby brother; together they play hide-and-seek and climb aboard the Ollie train! 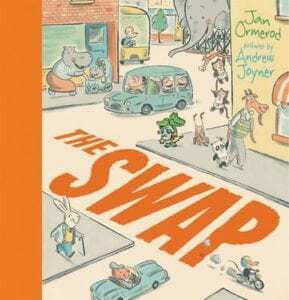 ‘The Swap’ by Andrew Joyner and Jan Omerod. Poor Caroline Crocodile has a new baby brother and all he does is dribble. Even worse, all her mother does is goo over him. What is she to do?! Perhaps she should swap him for a better baby at the baby shop? This is a wonderful, wonderful book which will have older siblings laughing out loud. I have gifted this book to MANY children lately as their ‘Big Brother/Sister present’. Love it! This is a great book for introducing the eldest child to the sorts of behaviours they can expect from a new baby in the family. Each double page spread poses a question to the reader; ‘what do babies play with?’: ‘what’s in a pram?’; ‘what is bathtime like’ and ‘what does a baby do?’ These question headings are answered with lots of illustrations and rhyming text. I love this one…about a little girl that is told ‘aren’t you lucky’ about this funny looking little baby that has stopped her world from just being about her. 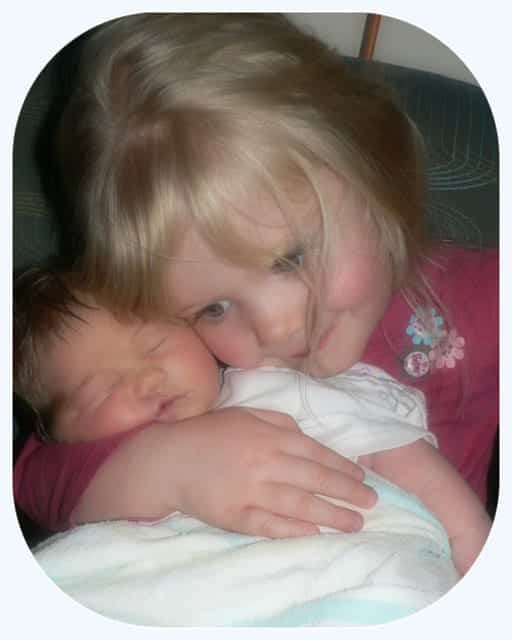 In the end the big sister learns to be a big helper and ends up loving her baby brother. By the end of the story all who see them together say ‘isn’t HE lucky’! Lucy is not so impressed when mum and dad introduce her new baby brother, William. He screams, he smells…Lucy really wants to just send him back to the hospital. From here the story slips into fantasy land as the doctor who delivered William presents Lucy with a succession of baby animals for her try out instead. These all prove far worse than little William could ever be and Lucy comes to the conclusion that baby William is pretty much perfect, as far as babies go anyway! This is a ridiculous tale that PudStar just loved. When she was sick of ChickPea screaming the house down one day she did suggest that maybe we should try a baby baboon like Lucy did. This is one that celebrates fatherhood in the whole equation. Young brother and sister Lachlan and Caitlin are super excited about the new baby mum is having. Lachlan thinks that dad is having a horse as well and the story takes us through the pregnancy and birth…of the baby, and a horse! Sophie is so excited about the birth of the new baby, she cannot wait! But when bub arrives Sophie discovers that is not always as exciting as she had dreamt.. Young children will enjoy sharing and talking about this much-loved classic picture book, with its perceptive, heart-warming and witty observations on the arrival of a new baby. When is the new baby coming? What will we call it? What will he do? We don’t really need a baby, do we? Brilliant author and illustrator duo Burningham and Oxenbury answer all these questions and more in a gorgeous story following a mother and son as they share the journey from the start of a pregnancy to the birth of a sibling. The young boy is nervous, excited and just cannot wait to see what the baby will be like…imagining all sorts of things that baby will do in the future.This gorgeous book could very well become a classic. Dear friends gave PudStar this on – perfect gift for the ‘big’ brother or sister when baby arrives. Za-za doesn’t like having a new baby brother. His mum is always tired and everyone spends all their time coo-ing and cuddling the baby. No one has any time for him! One day, when Za-za demands a hug from his mum, she tells him to try and give his new brother a cuddle… Za-Za discovers the cuddle was not so bad, and so starts the relationship between the siblings. The story ends with Za-Za getting some time alone with his mum, being read a book in bed. Perfect! Miffy has a sibling and it’s a little strange…Will mama bunny still love her? If you love Miffy books then this is perfect for you; we have the whole collection of Miffy – some of which are from my childhood. This book has a fabulous opening sentence: “Mrs Arnold was going to have a brand new baby, she wore dresses as big as tents’. This is a family with two siblings already, and everyone is pitching in to help get ready for the brand new baby. The book takes us through the final stages of pregnancy, the birth of a new baby at the hospital, and coming home – on a bus! It’s full of great comments about babies; “Wendy thought Walter looked a bit like a sleeping prune” and “(mum) fell asleep a lot when she wasn’t with baby Walter”. In typical Bob Graham style the illustrations show a real family, lots of chaos, lots of colour, lots of reality. I just adore Bob Graham books. I actually cried reading this to PudStar one day when ChickPea was a few weeks old and screaming the house down…it just reflected the chaos of my life so well. Lovely! More proof that you’re a thoughtful organised mumma. Makes me want to have another baby just so I can read these to the girls!! No Karen…DON’T DO IT!!!!!!!!!!!!!! I think that is why I gave all my copies of these books away…no more talk of new babies in this house thank you very much! They are very lovely books all the same! After an initial glance, I have had this post bookmarked for ages and have FINALLY had a chance to sit down with a cuppa and go through all the links and books in detail. So hard to decide which ones to get for Little Miss, but time is running out. We borrowed two books from the library the other week: “Emma Cries” (Dean Jacobs) and “The Boss Baby” (Marla Frazee) which I particularly like, but which goes over A’s head a bit. She LOVES “Emma Cries” and asks to read it multiple times a day (and ‘reads’ it to herself and her bubbas now). As always – I knew I could rely on you for a great post with wonderful (and educational) information! Now I have some choices to make.